Be the first to share your favorite memory, photo or story of Gerard. This memorial page is dedicated for family, friends and future generations to celebrate the life of their loved one. 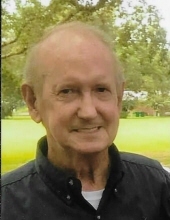 Gerard E. “Jerry” Tanner, 71, of Hurley, MS, passed away on Friday morning, April 12, 2019. Jerry was born on August 6, 1947 in George County, MS to the late Sherman and Mamie Lee Tanner. From making Eagle Scout in his youth, to serving as a volunteer firefighter with the East Central Volunteer Fire Department for a number of years, Jerry was always involved in his community. He was also the owner and operator of Hurley Barber Shop for 36 years. Through it all, Jerry spent his life serving the Lord and always put his relationship with Him first and he attended Canaan Assembly of God Church. In addition to his parents, Jerry was preceded in death by his two sisters and three brothers and also his father-in-law and mother-in-law, Claude and Lucille Todd. He is survived by his loving wife of 45 years, Voncille Tanner; sister, Myrtle Whittington; sisters-in-law, Alice Long, Frances Roberts, and Betty (Donnell) Pierce; along with numerous nieces, nephews, lots of loving relatives, and friends. The family would like to thank Encompass Hospice for the loving care and comfort that they provided to Jerry in his final days. The visitation for Jerry will be held on Monday, April 15, 2019 from 10:30 a.m. until 12:00 p.m. at Canaan Assembly of God Church. The funeral service will follow at the church beginning at 12 noon with Bro. Rodney Coleman officiating. Interment will be held at Rosedale United Methodist Church Cemetery with Braxton Collins, Danny Pierce, Zack Weston, Pierce Tullos, Scott Tullos, Charlie Weston, and Todd Shotts serving as pallbearers. Honorary pallbearers will be Eliseo Fuentes, Gwain Webb, Alan Williams, and Terry Estis. Heritage Funeral Home, locally owned and operated in Escatawpa/Moss Point, MS, is in charge of arrangements. To send flowers or a remembrance gift to the family of Gerard E. "Jerry" Tanner, please visit our Tribute Store. "Email Address" would like to share the life celebration of Gerard E. "Jerry" Tanner. Click on the "link" to go to share a favorite memory or leave a condolence message for the family.